Electronics assembly tweezers, wire cutters, vacuum pick-up pens & systems, diamond scribes, micro mini tools. TDI high precision hand tools are engineered to meet and exceed the requirements for electronics assembly, labs, clean rooms and circuit board repair and rework. Made of the highest quality materials and tool tips are perfectly balanced offering fine tip symmetry for precision work. 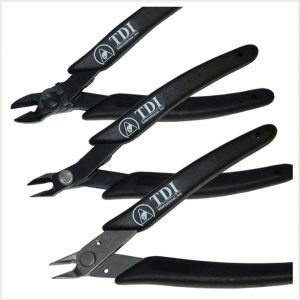 TDI offers electronics assembly tweezers, including high precision Swiss tweezers, precision, and industrial grades. These include fine tips, ESD safe tips, ceramic tips, wafer handling, and reverse action tweezers. Most of our metal tweezers are also available with Teflon coating upon request. 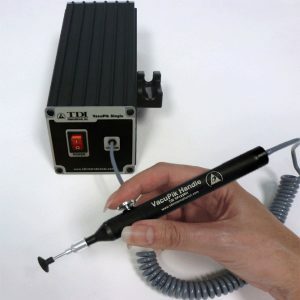 VacuPik® Vacuum Tools provide a precision ultra quiet vacuum pump and a large selection of ESD safe tips for handling a variety of parts for electronic assembly requirements. Typical applications include circuit die, SMT assembly, substrates and flat components. The power supply is a compact tower design requiring minimum workstation space. All TDI Vacuum Pickup Tools are for use with dry applications only. For Pick and Place applications only, not for use as a vacuum cleaner. Request a Quote for Volume Quantity Discounts! High precision wire cutters for soft wire, copper wire and component lead cutting for electronics assembly, medical device assembly, circuit board repair and rework applications. 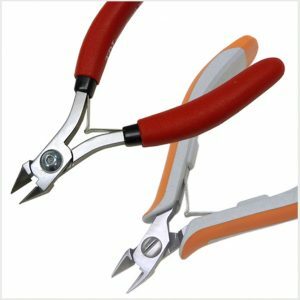 These wire cutters feature ESD safe comfort grips. TDI's Diamond Scribes are high precision and designed for optimum scribing or marking of thin film circuits, wafer marking, microcircuits, small circuit boards and to clean or trim circuits in microelectronic applications. “PVH” diamond scribes line includes a gold anodized, lightweight aluminum pin vise handle with a knurled grip for easy non-slip handling. This pin vise features an anodized steel holding collet, adapter and drawbar for interchanging diamond tips. “HSD” diamond scribes are designed for scribing or marking super hard surfaces including silicon and alumina ceramics in electronics assembly and rework. These scribes offer a .060″ diameter diamond permanently mounted on a .300″ stainless steel shank and available with bent or straight tips. Handles are non-rolling hexagon shaped. "MMD" micro mini diamond scribes have permanently mounted tips with .020" diameter straight or bent tips. Non-rolling, lightweight gold anodized handle. Request a Quote for Volume Quantity Discounts! 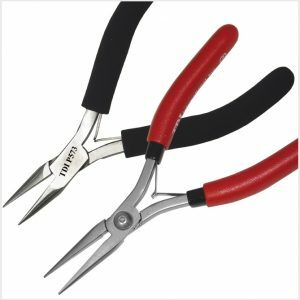 Industrial pliers for lead forming, wire bending, straightening and holding delicate parts in electronics assembly, medical device assembly, circuit board and rework applications. Request a Quote for Volume Quantity Discounts! A variety of micro scissors designed for very fine wire and material cutting to meet the requirements for electronic clean room, assembly and laboratory applications. Precision stainless steel micro scissors offer an ergonomic spring reverse action design with sharp edges for very small cutting applications. Available with angled, bent or straight tips with a short or long handle. Our high precision assembly hand tool kits are designed to meet the requirements for electronics assembly, labs, clean rooms and circuit board repair and rework.